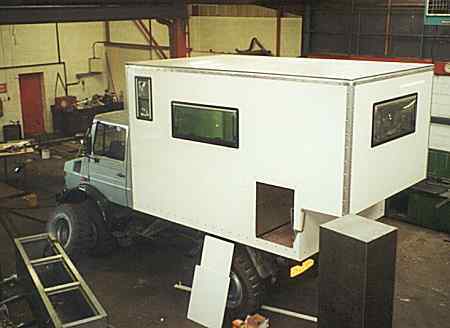 Unimog into Campervan (Purchase and Body). On the 8th of May 2000 I purchased an ex-army Unimog U1300L from Frank Atkinson. With a ground clearance of 435mm, an approach angle of 51° and a departure angle of 46° this is a formidable off-road vehicle. The 5.6 litre 96kW diesel engine drives the wheels through an eight speed box and portal axles. My Mog was first registered in April 1980 and has about 25,000km on the clock. Originally painted in camouflage it was serviced, cleaned and sprayed silver by Frank Atkinson. 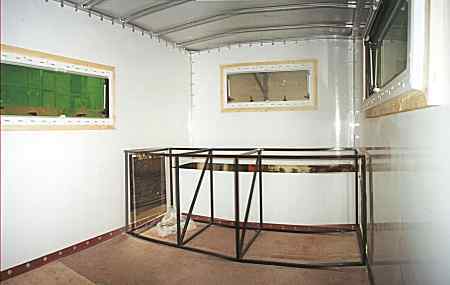 In order to gain the maximum space the body has been extend to the maximum allowed by the UK Construction and Use rules. 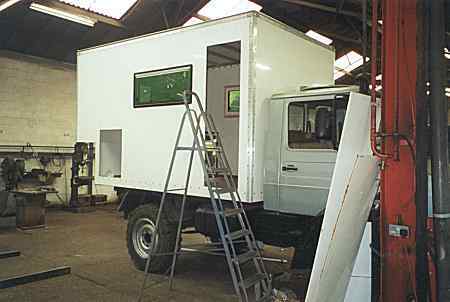 To retain the departure angle the rear part of the body is cut away, this space is used to carry a demountable Jerry can rack and/or sand mats. 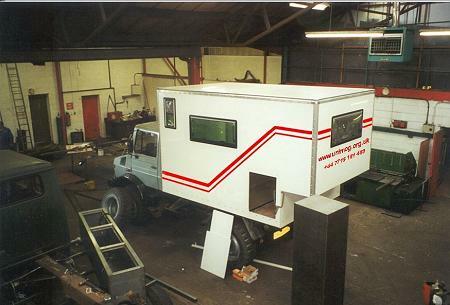 The campervan body design (loosely based on the one in John Speed's excellent book Travel Vans) incorporates a permanent bed across the rear of the vehicle with externally accessible storage underneath. If you would like a copy of the simple CAD drawings of my MOG body (in GIF image format) click here for the top, left, right and back views. In May 2000 the chassis cab was transported to Willingham's (near Hull in England) who have done an excellent job in building a GRP/Plywood body on the metalwork of the original flat bed. Because the body of a Unimog is designed to twist on the chassis the tunnel between the cab and the body has to be very flexible! I may add some art work to the body in order to give it a more professional appearance. The rear hatch (right) provides access to the two 6Kg propane cylinders used (only) for cooking. The combined four burner hob and sink will be just below the central window. A wind deflector has been fitted to the front of the body, more for aesthetic than aerodynamic reasons, with a top speed of 90kph (55mph) wind resistance is not likely to be a major cause of fuel consumption! The metal frame provides rigidity and supports the external demountable Jerry can rack as well as providing the base of the bed. The left section houses the two propane cylinders. The center section will be divided into a lower part containing the two 58Kg batteries and an upper storage area accessible from inside. The right hand section (only accessible from the outside) will be used to house general camping equipment, chairs, tables and fire wood. The floor and walls will be insulated with 30mm of X-trem (a non combustible waterproof closed cell polyethylene foam - 0.02 W/M x K) most of the roof will be insulated with 45mm of X-trem.